The remote location of the Antarctic and Greenland polar ice sheets may leave us with the impression that developments in these regions have little effect on the climate and life in the temperate zones of the Earth, where most of us live. We may therefore be forgiven for asking why should we care when these changes are projected to unfold over tens to hundreds of years. However, the stability of the polar regions is critical for maintaining a planet with the conditions that allowed the emergence of humans, agriculture and civilisation, as well as many other species. The polar ice sheets serve as “thermostats” of global temperatures from which cold air and cold ocean currents emanate, moderating the effects of solar radiation. The ice sheets regulate sea levels, store volumes of ice whose melting would raise sea level by up to 61 metres. Unfortunately, what’s happening with the polar ice sheets now ought to warn humanity of what is to come. For example, a recent paper suggested that melting Antarctic ice sheets could lead to 0.6-3.0 m of sea level rise by the year 2300. This is based on modelling of greenhouse gas emissions out to 2300. If greenhouse gas emissions continue unchecked, the world may warm by 8–10℃ by 2300. Such a temperature rise could raise sea levels by tens of meters over hundreds of years. The recent paper only looked at sea level rise from melting Antarctic ice sheets and does not take into account sea level rise contributions from the Greenland ice sheet (currently about 280 billion tonnes per year), which would more than double the Antarctic contribution. Much of the discussion in the paper and related papers appears to assume linear global warming – that is, little change to the rate of warming over time. Little mention is made of feedbacks which could increase the rate of warming. Such feedbacks could arise from reducing albedo, where solar radiation usually strongly reflected by ice is replaced by strong absorption by water. Other feedback processes associated with warming include methane release from permafrost and bogs; loss of vegetation; and fires. In a recent article, former NASA climate scientist James Hansen and a large group of climate scientists point to observations arising from detailed studies of the recent history of the atmosphere-ocean-ice sheet system. The climate records of the past — specifically, the Holocene (from about 10,000 years ago) and the Eemian interglacial period (about 115,000 to 130,000 years ago) — are closely relevant to future climate projections. These records include evidence for rapid disintegration of ice sheets in contact with the oceans as a result of feedback processes resulting in sea level rise to 5-9 m above current levels. All this during a period when mean global temperatures were near to only 1℃ above pre-industrial temperatures. Sea levels reflect the overall global temperature and thus of global climate conditions. As shown by the position of the circles in the chart below, the ratio of sea level rise (SL) to temperature rise (TR) during the glacial-interglacial cycles was approximately between 10-15 metres per 1℃. Plots of Temperature rise (relative to the pre-industrial age) vs relative sea level rise in (meters). By contrast from around 1800 to the present sea level rose by an approximate ratio of 0.2-0.3 m per 1℃. This suggests significant further rise towards an equilibrium state between sea level and temperature. 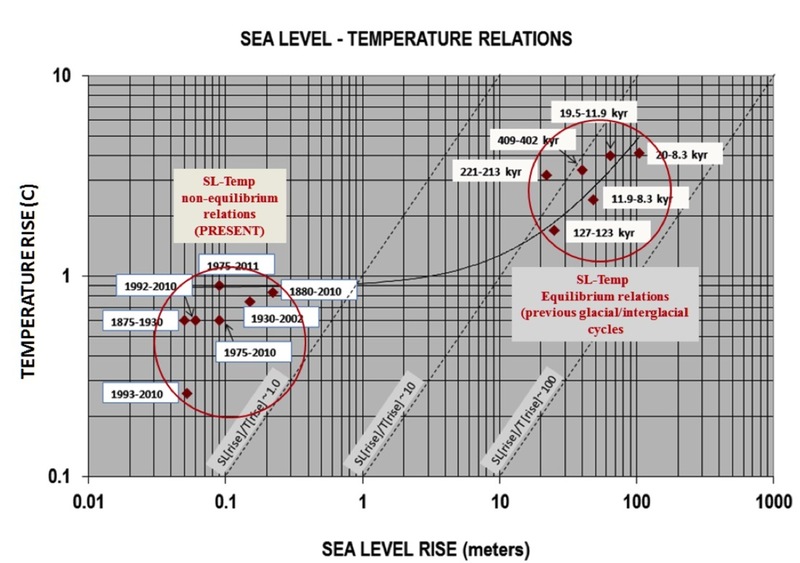 Thus, the points in the right-hand circle represent long-term temprature-sea level equilibria in the past while points in the left-hand circle represent where we’re at now, namely at an incipient stage moving toward future temprature-sea level equilibrium. Why Should Long Term Climate Change Matter? Due to the extreme rate of CO₂ and temperature rise during the 20th century relative to earlier events and the non-linearity of climate change trends the timing of sea level rise may be difficult to estimate. Further melting of the ice sheets will destroy the climate conditions which allowed agriculture and the rise of civilisation in the first place. The lower parts of the world’s great rivers (Po, Rhine, Nile, Ganges, Indus, Mekong, Yellow, Mississippi, Amazon), where more than 3 billion people live and the bulk of agriculture and industry are located, sit no more than a few metres above sea level. 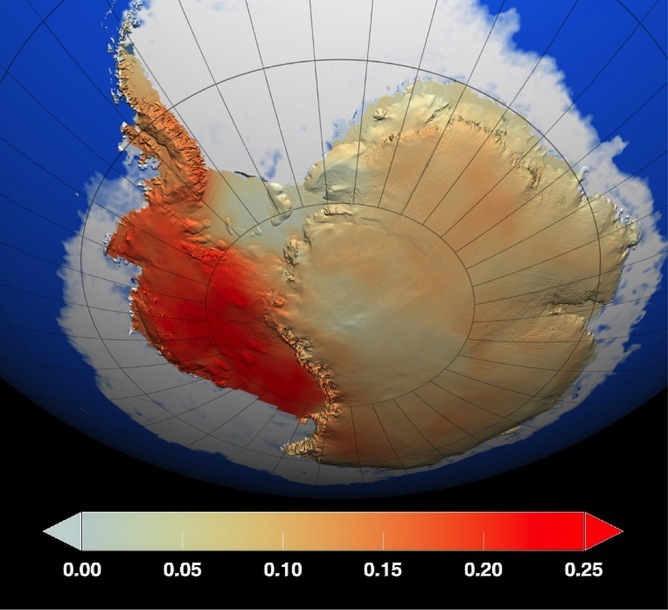 Further melting of the Antarctic and Greenland ice sheets can only result in sea level rises on the scale of tens of metres, changing the continent-ocean map of Earth. Global temperatures have already risen 0.9℃ and continental temperatures 1.5℃ degrees above pre-industrial levels. If we account for the cooling effect of sulphur aerosols from industrial pollution, greenhouse gases have already contributed 2℃ of global warming. The current rate of global warming, faster than any observed in the geological record, is already having a major effect in many parts of the world in terms of droughts, fires, and storms. According to James Hansen burning all the fossil fuels on Earth would result in warming of 20℃ over land areas and a staggering 30℃ at the poles, making “most of the planet uninhabitable by humans”. In 2009 Joachim Hans Schellnhuber, Director of the Potsdam Climate Impacts Institute and Climate Advisor to the German Government, stated: “We’re simply talking about the very life support system of this planet”, constituting one of the most critical warnings science has ever issued to our species. Mitigation plans proposed by governments would slow down the rate of carbon emissions but continuing emissions as well as feedbacks from ice melt, warming oceans, methane release and fires would continue to push temperatures upwards. An effective technology required for global cooling efforts, if technically possible, would require investment on a scale not less than the trillions of dollars currently poured into armaments and war in the name of defence (more than $1.6 trillion in 2014). Which planet do current decision makers think we are living on?